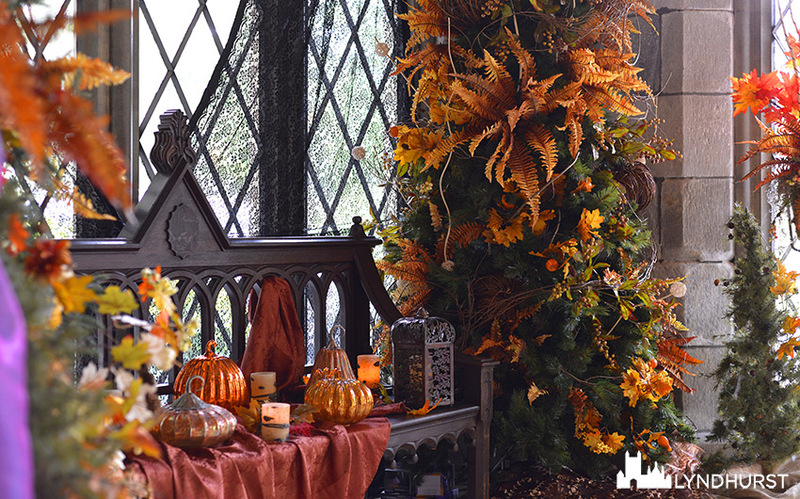 On the mansion tour with a Halloween twist, you will see the majestic vestibule and entrance hall, reception room, parlor, library, and the sumptuous Victorian dining room – all decorated with seasonal trimmings for Halloween. The second floor, which centers around the grand Picture Gallery, is not decorated and visitors can see those spaces in all their traditional splendor. For those wanting to see the mansion and the beautiful seasonal decorations, this is the better option than the nighttime performances, as the focus is on the many Gothic Revival furnishings we bring out of storage and display during October only. These tours are appropriate for children of all ages. This one-hour tour visits the main two floors of the mansion. This tour has timed entry. Please arrive 20 minutes before the entry time printed on your ticket in order to have time to park and check in at the Welcome Center. Advance online ticket purchases are recommended – tours do sell out. Photography is allowed at the discretion of your Tour Guide. Please stay with your tour group. Please wear shoes appropriate for walking on hilly grounds. No refunds or exchanges can be made during the Halloween season. Accessibility: Lyndhurst welcomes all visitors, but please note that all tours of Lyndhurst require walking on hilly grounds and the ability to be standing for approximately one hour. While the tour visits two floors of the mansion, only the first floor of the mansion is handicap accessible. There is no elevator in this historic building. Extreme Weather Policy: Welcome Center staff will do their best to give notice if tours are interrupted, delayed, or canceled due to extreme weather. If Lyndhurst cancels your tour for weather-related issues, we will endeavor to reschedule. If rescheduling a tour canceled by Lyndhurst is not possible, we will offer visitors a refund for their tickets.